This is yet another classic book that, for some reason, despite being a fan of Pearl Buck, I was never motivated to read until last month. And I didn’t exactly read the book, because I listened to the audiobook. A few words on the audio-format. This was the first fiction audiobook I tried. Despite being extremely skeptical of one voice representing several characters, I decided to try it anyway. And I was blown away by Anthony Heald’s expert narration. It was fantabulously marvelous! The experience of going through this epic book was so much more enhanced, thanks to the brilliant narration. He captured every character, every emotion, every setting, every subtlety so masterfully. He should be given some award for this work. It was really really hard to turn off the book. I could just listen to the beauty of his narration all day. Now, after that bit of raving, I will now begin raving about the book. 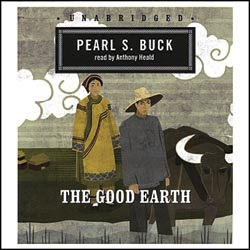 This is indeed Pearl Buck’s best that I have read so far. It’s a hauntingly beautiful and sensitive book that truthfully encapsulates life in China during early-mid twentieth century. You might scoff at me for inserting the word “truthfully” in the last sentence, because you may know that I have never ever lived in China nor studied its culture/history to make that claim. So, let me rephrase that a little. I think most people from the East share a common overarching socio-cultural philosophy, regardless of our country of origin, religion, or backgrounds. We understand that cultural thread. We can intuitively recognize and strongly relate to the underlying ideology behind certain values, views, and traditions, even if the external representation of those traditions are different. Pearl Buck beautifully entwines these socio-cultural values and traditions in every sentence of the book. The ideologies are expressed in the most subtle yet powerful ways. For example, the embarrassment, fear, lack of confidence, and anxiety that Wang Lung goes through when he encounters the watchman at the gates of the House of Hwang, and the interaction the two of them have is an incredibly sensitive and right-on-the-dot illustration of specific attitudes and sociocultural norms that’s hard to express. It’s something so subtle, so trivial, and almost too relatable for those of us from the East, but it takes a keen eye (and mind) to absorb, understand, and integrate these common occurrences in beautiful prose that neither overwhelms nor bores the reader. It fleshes out the intricacies of a complex culture in a convincingly coherent and objective manner that’s easy for the reader to assimilate and digest. It is true that when someone truly understands the breadth and depth of something, they use the simplest, most easily comprehensible examples to convey their meaning. Pearl Buck is one of them. The characters are flawed and human. Just like all of us. Each character evolves and grows with the story of their lives. Their personal growth and failings are sometimes understandable, sometimes worthy of sympathy, and sometimes disappointing and worthy of disapproval; just like the characters in our life. But, even with all the changes and transformations, Pearl Buck reatins the core and the essence of the characters all through their journey; just like how all of us have a core of constancy in us that's untouched no matter how much we do change. This is why I used the term “truthful”. The book is truthful in all aspects, but most particularly, it is truthful in its portrayal of human nature. Pearl Buck excels in the nuances of human nature and psychology. She paints all her characters with the varied, realistic hues of human nature - black, white, and everything in between. The irate reader might now demand - ok, what of the story itself? Well, it’s the story of Life. The epic life story of Wang Lung and his descendants. The story of a poor Chinese farmer who dares to be ambitious, hardworking, and honest in his unforgivingly cutthroat society that scrambles to survive. The story of fierce ambition in the face of social insecurities, of trials and tribulations, misery and contentment, a power struggle between man and woman, poor and rich, old and young, beautiful and plain, corruption and innocence. The book is a rich experience of a farmer’s life in China, almost a hundred years ago. It deserves all the praise and laurels. A highly recommended read for those that enjoy character driven books soaked in culture and history. I just finished it - thanks to your review. Wholeheartedly agree with you - a wonderful narration. It was my first experience with an audiobook and although I am not sure how much I will engage with the medium in the future, I believe I could do it the first time, only because of the power of the narration. And what a wonderful book. It is the kind of subtle nuance that only comes from spending nearly four decades in another culture. A thought provoking story with great historical context. I'm glad you enjoyed the narration and the book, Suvasini! It really deserves its acclaim.